Do you know about BookTube? I only recently discovered it. It seems to mostly be young ladies in their teens or early twenties to make videos about the stacks of YA novels they just got, and gushing about how beautiful the covers are. I think it’s neat (if somewhat overwhelming), but I would be more into it if there was more… uh… grown-up(?) content to be had. 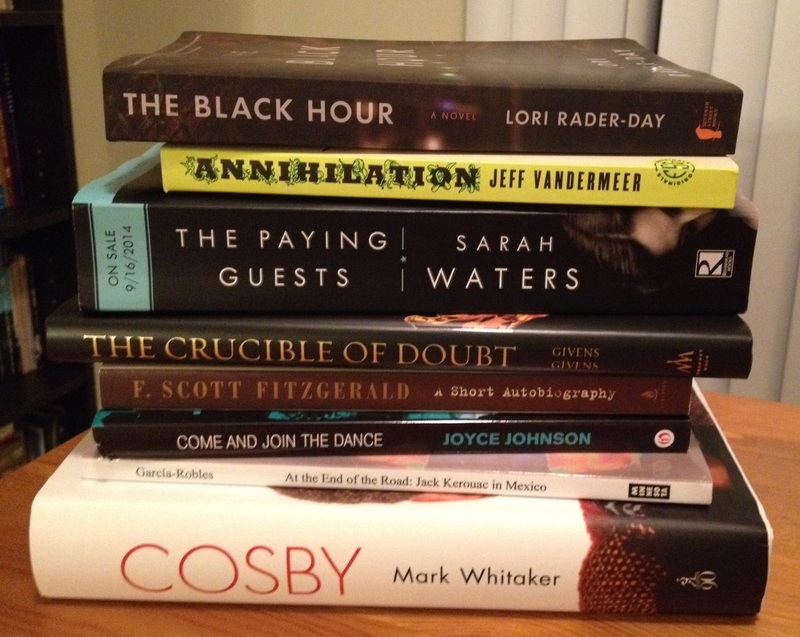 More literary fiction, maybe some subject non-fiction. So I briefly entertained the idea of starting a BookTube channel myself doing that very thing. But the more I thought about it, the more I decided against it because A) I don’t think I look very good on camera, nor do I have camera equipment besides a webcam, B) I don’t know if I want to make the “brand” commitment and stick to it, and C) that’s a lot of content creation, and I don’t know if I want to dedicate some of my free time to doing something that will inevitably stress me out. So I’m backing off the idea of BookTube and going to see about doing more on the Twitter side of the bookish social media, and maybe use this blog as more of a platform for what I would put in a BookTube video without the anxiety of being on camera and working in a medium I’m not as familiar with. Let me interject here to say that I have started entering myself for a lot of giveaways on Goodreads, Book Riot, Shelf Awareness, and any other book-related drawing/giveaway that I stumble upon. I may need to chill out on that after the response I got this month! The first is Cosby, by Mark Whitaker. Like most children of the 80s (and 70s, but I was born in the 80s), I was a big fan of Bill Cosby, specifically the Cosby Show. Loved the humor, loved the sweaters, loved that my parents and I could enjoy the show together. I really don’t know too much about Bill Cosby the person, aside from the fact that he used some of his real-life family situations to influence events on the Cosby Show, and that just makes it more endearing. So I’m looking forward to learning more about his formative years and how that influenced his comedy. The reviews I’ve read about it so far say it’s a decent book, nothing ground-breaking, but a good overall look at Bill Cosby’s life, career, and impact. Plus, after just reading Cary Elwes’ As You Wish memoir about the making of The Princess Bride, and learning that Cary did a Fat Albert impression during his audition for the film, makes me love this all the more! Next, I got At the End of the Road: Jack Kerouac in Mexico, by Jorge Garcia-Robles. Like many bookish teens, I went through a Beat phase as a teenager. LOVED On the Road. I’ve amassed a small collection of Beat novels and memoirs, and have found that I have a love/hate relationship with the Beats. I am fascinated by the artistry, and the ways they advanced literature, but I find their personal lives more pathetic than romantic. Maybe it’s a sign I’m getting older, but I find it rather despicable how these guys would run from their responsibilities the way they did. REGARDLESS, I’m still looking forward to reading this and learning more about my idol from when I was 14. I won a drawing from Paste Books for a signed copy of Annihilation by Jeff VanderMeer. The Book Riot folks were going NUTS over this, the first of the Southern Reach trilogy, and it’s really starting to take off, so I was super excited to read it. It’s very intriguing, very mysterious, and I finished it with more questions than answers – which is good since it’s a trilogy! I bought the whole set for my library, so once the other two come in I’ll have to finish the story. THEN I won a book from Shelf Awareness — The Paying Guests by Sarah Waters! I had not read any Sarah Waters, but this book is getting HYPED on the book interwebs. I was advised to set aside a weekend to knock it out. Didn’t quite have the full weekend free, but I had enough time that I did tackle it this past weekend. SOOOOO GOOOOOOOOD. A marvelous page turner, very evocative of the time period. Definitely for Downton Abbey fans, for sure! Now, every once in awhile I search for Joyce Johnson in my book searches. She’s the author of a fabulous memoir called Minor Characters about her early life, and when she was with Jack Kerouac as he became famous for On the Road. (Are you noticing a trend?) She’s published some fiction titles, and I was lucky enough to find (and read) two of them at the Charleston Public Library many years ago. But her debut novel, Come and Join the Dance, has been out of print for decades. NOT ANYMORE! Her three novels are available again! I could have jumped for joy when I saw that! This is one of the earliest Beat novels – it just didn’t get the recognition it deserved because it’s author is a woman. This is a facet of the Beat lit movement I am fascinated by! So I immediately added it to an Amazon cart. So then to get free shipping (I’m a sucker for it), I added two more books to the cart. First, A Short Autobiography by F. Scott Fitzgerald. TOTALLY been on a Fitzgerald kick (LOVE the man very much), and this is a collection of essays he wrote for various outlets about his life, that have now been compiled. I’m looking forward to reading this and getting some more Fitzgerald writing to enjoy. The second is A Crucible of Doubt, by Terryl and Fiona Givens. A religious title, yes, because I read those as well. Their last book, The God Who Weeps, is superb and a title lots of intellectual Mormons have been touting for the past couple of years. I expect this latest release to be no different. And THEN I won another giveaway, this time for a copy of The Black Hour, by Lori Rader-Day. It’s a timely novel, about a professor returning to a fictional Illinois university campus after being the victim of a school shooting, and the book goes into the aftermath of such a tragedy. I’ve only heard good things about it, and it takes place in my former stomping ground of northern Illinois, so I’m looking forward to getting into it. Plus, this book came with a free t-shirt for the fake university! It’s an XL, so I’ll probably never wear it in public, but STILL. Don’t know if my book-acquiring habits will continue at this rate – I still have a bunch of digital ARCs I want to get through – but anyway, here’s glimpse at my current Book Life.